Elizabeth Acton gave instructions for clarifying beef marrow and several uses for the clarified marrow which would “remain good for months” in the 1845 and 1860 editions of her Modern Cookery published in London (given below). I made this once with one batch at the electric stove on low and one at the hearth. There really is a difference if not low enough, and I also found once melted, there were small chunks (Acton called sediment) which had to be strained out. Two sheets of paper spread separately with a thick layer of butter, clarified marrow, or any other fat, and fastened securely over the outside of a joint, will prevent its being too much dried by the fierce heat of the oven. 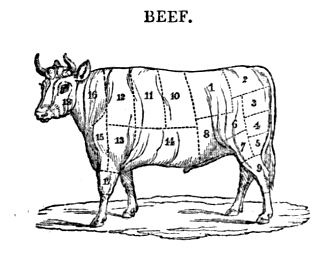 At a season when butter of pure flavour is often procured with difficulty, beef-marrow, carefully clarified, is a valuable substitute for it; and, as it is abundantly contained in the joints which are in constant request for soup-making, it is of slight comparative cast in a well managed kitchen. It is often thrown into the stockpot by careless or indolent cooks, instead of being rendered available for the many purposes to which it is admirably adapted. Take it from the bones as fresh as possible, put it into a white jar, and melt it with a very gentle degree of heat at the mouth of the oven, or by the side of the stove, taking all precaution to prevent its being smoked or discoloured; strain it off, through a very fine sieve or muslin, into a clean pan or pans, and set it aside for use. It will be entirely flavourless if prepared with due care and attention; but, if dissolved with too great a degree of heat, it will acquire the taste almost of dripping. A small quantity of fine salt maybe spriukled into the pan with it when it is used for frying. SMALL CROUSTADES A LA BONNE MAMAN. Prepare the croustades as above, or use for them French rolls of very even shape, cut in thick equal slices. If quite round, the crust may be left on ; mark each slice with a small cutter in the centre, dip the croustades into butter or marrow, fry them lightly, or bake them without permitting them to become very hard; empty, and then fill them; dish them without a napkin, and pour some good brown gravy round, but not over them. Obs.—From being cooked without butter, these and the preceding patties are adapted to a Jewish table.